Local Bootcamp classes are a great way for mums to shed pounds without spending lots of pounds! If like most mums you are pushed for time and money but would still like to shed a few pounds and get fit, a great new local Bootcamp class could be for you. Based in Beddington Park and Purley, Abbie Parker's�new Bootcamp class involves a mix of�circuit training, kettlebells, resistance bands, cardiovascular training (running, jumping) and interval training - and it's all packed in to one hour! Abbie, who owns�AP Personal Training, is a personal trainer based at LA Fitness Purley and promises to work you hard and help you achieve your weight loss or fitness goals. "I've already seen some amazing results," says Abbie. 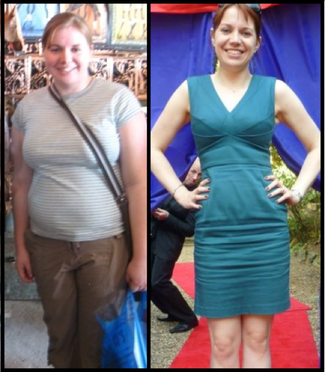 "Mums attending my classes have been thrilled with their weight loss and fitness levels. One of my client's, Amy, is pictured (see above) showing her fantastic weight loss since February this year!" As well as being an excellent way to get fit and lose weight, group classes are a great way to socialise and become motivated in a fun, healthy environment. Despite the slightly scary name 'Bootcamp' there is nothing daunting about Abbie's class. "It is suitable for all levels of fitness," explains Abbie. "Even beginners, so don’t worry if you haven’t got any exercise experience." Abbie's Bootcamp classes are on Thursdays at 9.30am in Beddington Park, Wallington (by the caf�/playpark area) and Saturdays at 9am on the Rotary Field, Brighton Road, Purley. �"At �5 per session you can’t go wrong!" adds Abbie. Any questions just give Abbie a call or email her and she’ll be happy to tell you more about Bootcamp. More details about Abbie's Bootcamp class and to read Local Mums' reviews.